last April, one of the big changes was moving comments to the sidebar and letting people reply to comments. Today, we’re updating comments in Google Docs to facilitate rapid and seamless discussions and integrate with email in an intuitive way. Since there are a number of significant improvements, this update is only available for newly created documents for now. 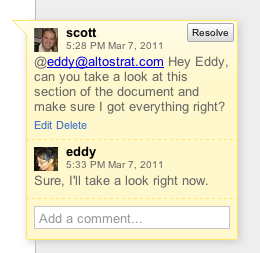 To start, we’ve improved the discussion flow by adding ownership and edit rights to individual comments. Each comment now has a timestamp and profile picture. 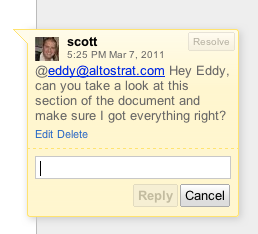 Google Docs doesn’t force you to delete comments. 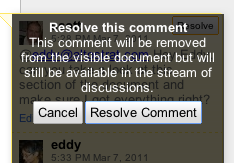 Instead, you can resolve comments to remove them from the visible document and view them later by clicking the discussions button at the top of any document. You can even re-open comments from here. We know you can’t watch all of your important documents all day to see if there are any suggestions, which is why we’ve integrated comments with your inbox to facilitate more rapid and responsive communication. You can now add someone to a discussion with an @mention. 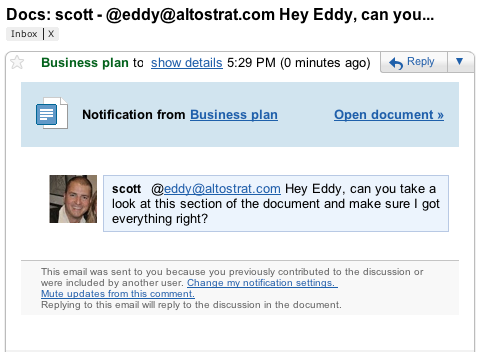 For example, typing @eddy@altostrat.com in a discussion will send a notification email to Eddy with the text of your comment. Eddy gets a message in her inbox with your question or comment. She can easily click through to open the document itself to respond, or simply reply to the email. 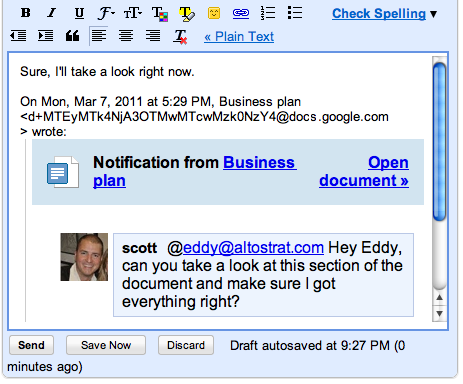 The reply will show up in the document as soon as the email is sent. 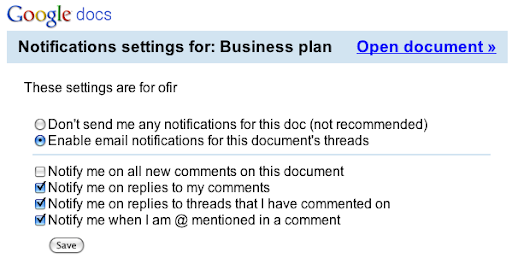 To turn off email notifications for a document, just select Mute updates from this comment at the bottom of any email or select Discussion notification settings... from the Discussions drop down. We've been using this next-generation commenting system inside Google for several months and have seen it make the feedback cycle shorter and get more people involved. The combination of added structure and intuitive email integration have really given life to the discussions that surround our documents, and we're excited for this new feature to do the same for you. Discussions will be available over the next few days to all users with personal Google Accounts as well as to Google Apps customers on the Rapid Release track. Please note that improved comments are only available in new documents at this time so if you want to try it out make sure to create a new document. 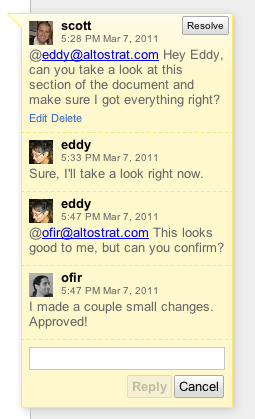 The comments you’ve created in existing document won’t be changed. We’re excited to hear what you think so let us know on in the comments. 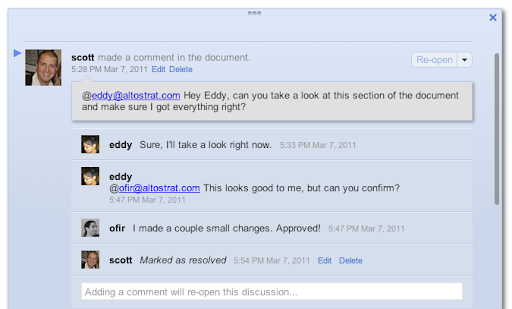 When we launched the new Google Docs last April, one of the big changes was moving comments to the sidebar and letting people reply to comments. Today, we’re updating comments in Google Docs to facilitate rapid and seamless discussions and integrate with email in an intuitive way. Since there are a number of significant improvements, this update is only available for newly created documents for now.